Represent. Stand up. Voice out. Hobbies and Interests: I enjoy playing sports of all kinds, reading psychological thrillers, rock climbing big face mountains and snowboarding. I am very much interested in knowledge. I am constantly thinking about new and old concepts or, even just random “what ifs” so, I spend a lot of my time on Google. Seeing that I am a new transfer, this week was my first opportunity to really get an idea of what clubs were offered here on campus. So far, I have shown interest in accounting club, and seeing as I just got out of the military in August; I joined the Veterans Club and am running for treasurer so long as we have enough members sign up. My reason for running is to bring people together. I’ve noticed a lack of interaction within the students as a whole and being that our campus is so new I have high hopes that if elected we can start some sort of mentorship program or, a beginning of the year mingle of some sort so that students of all grade levels can interact with one another and make coming to this new campus a little less intimidating for freshman students. Hobbies and Interests: My hobbies include working out and living life to the fullest. 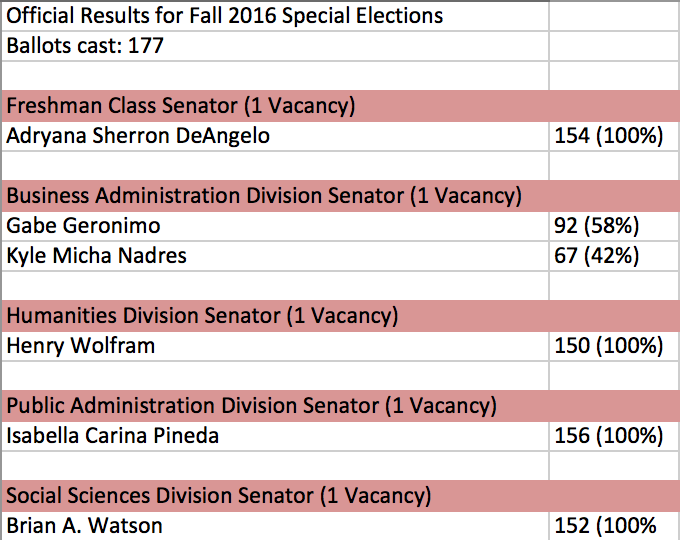 I, Brian Watson, would be humbly honored to serve as Social Sciences Senator. With previous leadership experience in JROTC and the work environment, I believe I have the necessary qualifications to step into my position with confidence and competence. Being the Social Sciences Senator will offer me the opportunity to help unite the persons within that field as a whole so they may benefit benefit from one another. College is a wonderful experience, but can also be scary and confusing. I would want to help people answer their questions and provide them with support so that they may take all that they can and excel. By listening to the students and their concerns, the social science majors will be able to confidently progress towards their goals. Back when I was in high school I used to be the president of the Gay Straight Alliance club. I was also an active member of the Filipino club and the ceramics club. For the Filipino club we would do beach clean ups at the Santa Monica beach and educate ourselves with Filipino history. For the ceramics club, we would make potteries for local communities to brighten up their day. I am running to be apart of something special. I plan to create an environment where individuals can openly be comfortable with themselves. In the past few years, I have been a part of several various businesses and projects that have allowed me to apply the knowledge I have gained through my time as college student. As the Marketing Manager for a small travel agency since 2013, I’ve been able to gain invaluable experience as a marketer heading into my final semester. Working for a small business, you realize fairly quickly that the success of the company is directly correlated to every decision you make, or don’t make. When you’re dealing with real dollars and cents, I’ve learned that every expense needs to count. It’s helpful to be analytical. It’s crucial to be resourceful. I truly believe that being a part of the ASUHWO as Business Administration Senator would only further prepare me for my career field while also providing an exciting opportunity to collaborate with my peers from all fields of concentration. 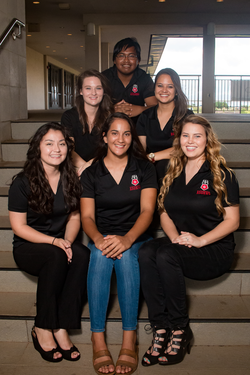 I have leadership experience currently involved with being a Student Ambassador during the Summer FNSO's and PUNUA for the upcoming Freshman. Also being a current Pueo Leader for the 2016-2017 school year that helps upcoming Freshman transition in college life. My reasons for running for Humanities Senator is to help others on campus with any problems that they may have, and you can always talk to me about it, represent my Humanities division with anything that the students need and want. From how I helped my mentees earlier the school year and helping International students visiting Hawaii from me being a part of International club. My goals that I will make if elected is to always make time for my constituency meetings and office hours for when I listen to my department's issues and concerns. Also to always email back the students and the standing committees. I am involved all over campus. I began my own club in Spring of '16 called Helping Hands, a club devoted to community wide charity work. I am also a PUEO Student Ambassador for the first year experience program at UHWO. One of my favorite things to do is to work with Martin by volunteering to give tours of our beautiful campus in my free time. I would love to be able to work on bringing in more guest speakers for Healthcare Administration as well as Disaster Preparedness. It was a great start by having someone come and speak about the possible live threat as well as having the active shooter drill on campus.